The history of science has a lot of really dark, racist, and outright horrible chapters. In an attempt to engage in the discussion on what to do with this history, the prestigious science journal Nature managed to piss off a large portion of the scientific community, by claiming that removing a statue of one of science’s most blatantly offensive figures was “whitewashing.” Today, Nature editor-in-chief Philip Campbell published a new article stating that the journal’s original take was wrong. Statues of controversial historical figures have become the center of heated debate, violence, and a resurgence of visible Neo-Nazis in the United States. Recently, vandals tagged the statue of one especially controversial scientist with graffiti that said “racist.” In response to the escalating debate over taking these statues down, Nature, which is among the highest-impact science journals, wrote an editorial implying that it did not support removing the images or names of often-offensive figures from places of public honor, like statues or street signs. The editorial, then titled “Removing statues of historical figures risks whitewashing history,” originally argued that “Instead of removing painful reminders, perhaps these should be supplemented” with plaques explaining the fraught history. 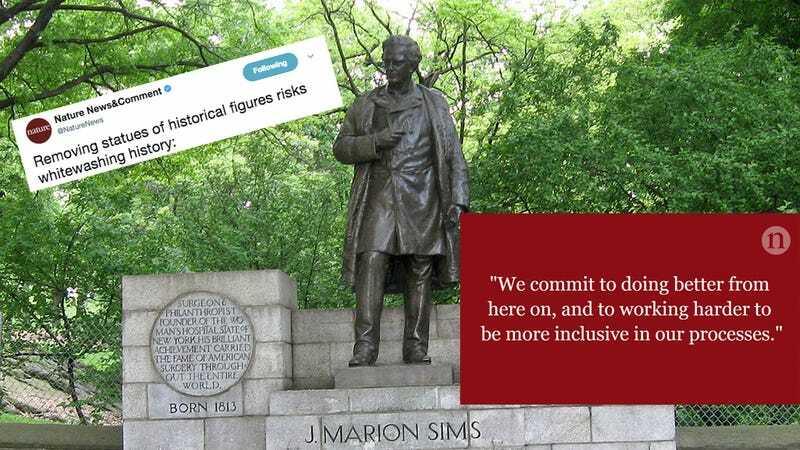 The discussion specifically revolved around J. Marion Sims, simultaneously known as the “father of modern gynecology” and a mad scientist who performed experiments on enslaved African American women’s bodies without anesthesia during the 19th century. In the wake of the recent violence at a white supremacist rally in Charlottesville, Nature’s position struck many scientists as tone deaf: A voice of authority in a field coming to terms with its own gender, diversity, and sexual assault problems defending a problematic scientist’s legacy instead of chastising Sims’ nightmarish behavior. Some scientists, including theoretical physicist Chanda Prescod-Weinstein, proposed boycotting given comment to or writing for Nature. Tons of scientists, laypeople and others argued that the hyper-selective journal’s decision to publish the commentary plays into the continuing narrative of excluding people of color and women from the sciences, while celebrating some of the field’s worst figures. The article has since been re-titled, updated, and corrected. Today, Campbell issued a statement that the article, its arguments, and its “overall tone were naive and unintentionally served to reinforce the insidious notion that women, people of color and minority groups do not have a place in science. This notion is wrong.” He wrote that neither he nor his colleagues could defend the editorial and will commit to doing better, including hiring an outside group to assist in understanding what went wrong. The statue conversation isn’t going away, nor is science’s dirty, ugly history, or its diversity problem. And while words are important, we’ll have to wait and see whether Nature really changes.